Many business owners mistakenly believe that creating multiple business listings for one physical location is beneficial to their search engine rankings. This is actually harmful to your website’s SEO. Another way duplicate listings can appear is due to the automated pull of search engines and directories. When your business information is added to an online directory, other directories may pull that information and your listings will appear across the web. In theory, the efficiency is ideal. However, sometimes those listings may have incorrect information. You’re then left with multiple listings that could result in confusing your customers and losing business. What’s the best practice? Remove the duplicate listings! Your business listings consist, at minimum, of your name, address and phone number (NAP). This is essentially your “digital thumbprint,” and how Google identifies your business as its own entity. It is ideal to keep this information consistent across the web. One of the listings will outrank the others. There is no way to predict which listing that will be. The listing that will show up in search results could have outdated/wrong information and confuse your potential clients. Even when you attempt to update these duplicates, you may not be editing the listing with the most authority and your changes may never go live. Your reviews could be split up throughout your various listings. Let’s say you have a handful of great reviews on one listing and only a few on another. Instead of having one listing with all of your reviews, your clients may be seeing only some of your reviews. The reputation you have been working to build may not be seen by many of your potential clients. Old listings can replicate. Data feeds from one directory to another and even one bad listing has the potential to be duplicated across all of the major directory sites. This can have a snowball effect, damaging your web presence over time and becoming more difficult to repair. How can you get rid of duplicate listings? Perform a Google search with the incorrect or old business information. Take note of all of the listings that rank the highest. Examine the listings and look carefully to see if there is any indication as to what site it was pulled from. This will give you an idea of where the source of the problem is. 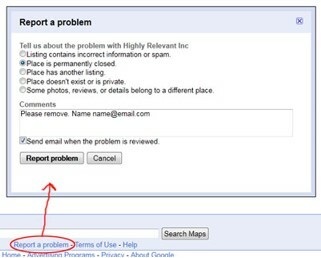 Most sites will provide a way to “report a problem”. You can then submit the correct information or report the listing as a duplicate of another. Give a thorough explanation as to what needs to be updated. This may even require verification steps before changes go live. 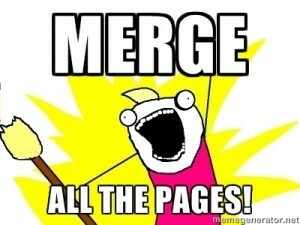 Some sites may also merge your listings together, or delete duplicates so that only one exists. Be sure to request that they do this for you. Claim your listings. Doing this verifies that you are the business owner and are authorized to maintain your listings. You will then be able to update your information freely and add extras such as photos and business descriptions! Claiming your listings will help diminish the possibility of duplicates. Many sites will recognize that you have an active and verified listing and remove the duplicates for you. Tip: Take the time to verify your listings on major sites such as; Google, Yelp, Yellow Pages, Dex Media, Express Update (Infogroup) and even Facebook. This will ensure that your business listings are accurate and up-to-date. You will easily be able to give your clients updates regarding what products/services you provide along with your most accurate contact information.